Out of Print - Click here to purchase this title as an eBook - downloadable PDF. The official guide on dining out, shopping and traveling gluten-free and allergen-free, a transportable book that helps you, your family, friends, doctor, dietitian, business associates and caretakers. Find bakeries, friendly restaurants, stores, B&B's, camps, cruise lines, theme parks, and vacation spots that welcome gluten-free and allergen-free diets - in the USA and parts of Canada. Gain insight on menu terminology, how to talk with the chef and international cuisines. Maintain up-to-date information on your favorite meals, baked goods, stores and travel experiences. 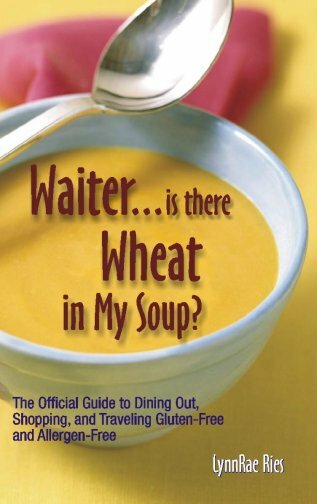 Waiter, is there Wheat in my Soup? provides a wealth of information. It is a "must have" book. Click here to purchase this title as an eBook - downloadable PDF.